Steve Reppert at UMass Medical School in Worcester has just come out today with two very exciting new papers on the circadian clock of the monarch butterfly. They’re both published through PLoS so they’re free for the looking online. Check them out here and here. I wrote my MIT thesis on Reppert’s work so I must admit I have a soft spot for this stuff. Below, I’m bringing you an excerpt from said thesis, discussing the work that’s now culminated in these two papers. Instead of studying in meticulous detail the circadian clocks of every living being, scientists focus on representatives of particular groups. For example, the mouse circadian clock is often used as a model for how mammalian clocks are built. Similarly, the fruit fly clock has long been a stand-in for insect clocks in general. Circadian biologists could safely assume that the monarch clock would resemble that of the fruit fly more than that of the mouse, because the monarch is more closely related to the fruit fly. 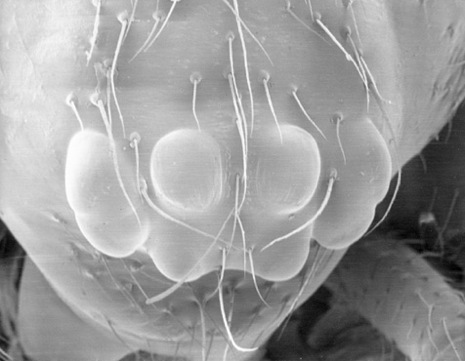 The fruit fly is much easier and cheaper to study than the monarch; its long history as a so-called model organism means that there are many well-established tools and procedures for working with it. So it seemed like a reasonable, and practical, approximation. In the fruit fly, as in most organisms, the clock resides in individual timekeeping cells. It works by manufacturing and then destroying certain proteins in a feedback loop that takes about 24 hours to complete. This feedback loop can sustain itself indefinitely, which is why the clock keeps working even in constant darkness. When the fly encounters daylight, though, a specialized protein in the timekeeping cell absorbs the light; it tells the clock that the sun is out by feeding into the loop. This specialized protein is CRY, the fruit fly version of the protein that illuminated the possible clock-compass connection. CRY is how sunlight sets the fruit fly’s clock. I know most of us have visions of turkey dancing in our heads right now, but picture instead a lobster. Just your average run-of-the-mill fresh-from-the-pot dinner lobster. Now picture a lobster twice that size — say a foot and a half long. Now picture a lobster claw that’s a foot and a half long. Can you visualize the lobster it would belong to? University of Bristol researchers recently stumbled upon a 1.5-foot-long fossilized claw from an ancient sea scorpion — a giant aquatic arthropod that roamed the floors of lakes and rivers 400 million years ago. The lobster analogy actually doesn’t properly convey this thing’s hugeness, because sea scorpion claws are proportionately smaller than lobster claws. Based on the size of the claw, and the relatively constant claw to body length ratio among sea scorpions, they were able to infer that the scorpion was about 8 feet 2 inches long. An 8’2″ scorpion. Eesh. That’s just 9 inches short of the world’s tallest man. They’re calling it Jaekelopterus rhenaniae, and it’s the largest arthropod ever. For now. One of the joys of being a scientist — particularly in a field that’s exploding — is that you get to name the things you discover. Maybe if I’d lingered longer in the lab before fleeing to a writerly career there would be a Jocelynetensium ricensis bacterium flagella-whipping its way across some bio student’s glass slide. But alas. Now my only option is to hound some generous scientist and make him like me so much that he wants to name something after me. Something really important. In the meantime, here’s a roundup of scientific whatnots with names — some eponymous, some not — that make you stop and ask, really? They got away with that? Adamcarolla and Drewpinsky. These two dispensed raunchy advice that I found both riotously funny and Very Important… when I was 13. But I’m not sure any of it — or even all of it combined — is worth an asteroid. Bacon. Okay wait. Are we talking Sir Francis Bacon? Kevin Bacon? Or greasy sizzling strips of porky goodness? If it’s the latter, I’m completely on board. Forbes. Can an asteroid be sponsored? What if that asteroid then collides with earth? Is the sponsor held resposible? GNU. All hail recursive acronyms. What about ASTEROID, for Asteroids Still Terrify Everyone Regardless Of Improbable Destruction? It was the spring of 1977, and New Englanders had monsters on their minds. In Dover, Massachusetts, three high-school boys spotted a creature with orange eyes and a melon-shaped head. Meanwhile, in Hollis, New Hampshire, a father driving with his two sons encountered a nine-foot-tall hairy behemoth. Arnold Vellucci, mayor of Cambridge, Massachusetts, took notice when the Boston Herald-American reported these mysterious sightings in side-by-side articles. But he wasn’t worried about aliens or Bigfoot, the usual suspects in paranormal sightings. Vellucci worried instead that the peculiar beings had escaped from a molecular biology lab at either Harvard or MIT.